Hi there! I’m thrilled you’re here today! Summer is about to hit with full force and sunscreen sales are increasing dramatically. Here, in the desert, we’ve been putting sunscreen on for a few weeks already. My oldest is allergic to one of the major brands of sunscreen and I’ve never loved slathering all those chemicals on my kids – or myself – especially after the research I did on sunscreens last year. So, I decided to try making my own DIY sunscreen. While the initial cost was more than a bottle of sunscreen from the store, I had enough supplies to get my family of 5 through all of last summer – we spent 6 weeks of our 8 week summer traveling and were outside A LOT. I also only used a fraction of the ingredients, so I didn’t have to buy anything this year. Overall, it’s evened out to be comparable to the cost of sunscreen from the store and it’s actually good for your skin. If you don’t want to recoup your costs over time, this would be a great project to split with a friend or two. I will let you do your own research on sunscreen because my goal here isn’t to try to convince you that homemade is right and wonderful and store bought is wrong and bad. We are actually a divided house on this matter. From personal experience, I prefer homemade sunscreen. My husband does not. We still use store bought sunscreen and our home is definitely not an organic, all-natural only home (she types as she sips her Vanilla Coke). I simply want to offer another option to what’s out there. Using chemical-free sunscreen is an option. It’s relatively simple to make, it will protect your family and it is good for your skin. My favorite thing about DIY sunscreen is that it doesn’t make me feel oily and greasy. I hate feeling sweaty, which often happens when you’re out in the sun, and it is 100 times worse to have that feeling compounded by an oily lotion. That has been a huge complaint of mine since I was a child and this homemade version solves that problem for me. This DIY sunscreen feels like any other body lotion I routinely use. What’s the benefits of making your own sunscreen? Well, here’s what I discovered last year. The actual making part is relatively easy. However, not everyone loves homemade sunscreen. My husband prefers the stuff from the store, while I prefer the homemade stuff. Costs about as much per ounce as sunscreen from the store – if you want to off-set the initial cost, share ingredients with some friends. Slightly whitens skin – doesn’t bother me any, but this is a definite downside for my husband. Lower SPF – Did you know that an SPF 40 is not equivalent to 2x the strength of an SPF 20? A SPF 20 blocks about 94% of UVB rays, a 40 blocks around 98%. We’re so fair skinned that we reapply every couple hours and a lower SPF doesn’t make much of a difference for us. Takes a little longer to apply – This is the biggest reason my husband doesn’t like homemade sunscreen, however our leftovers from last year are spreading better now. Making your own sunscreen lotion is easy, once you find your ingredients. However, I’ve tried to make that super easy too. I’ve included links to the exact products I use in my sunscreen. I buy from Bulk Apothecary and have since 2011. I’ve always been happy with their products and their pricing is hard to beat (although shipping sometimes feels a little pricey). The only thing Bulk Apothecary doesn’t have is the Raspberry Seed Oil, which you can get on Amazon. You could probably find all the ingredients on Amazon, but it can be hard to know what quality you’re getting. I trust Bulk Apothecary. I use this kitchen scale to measure out my ingredients and highly suggest this method if you can. You’ll get more precise ratios. 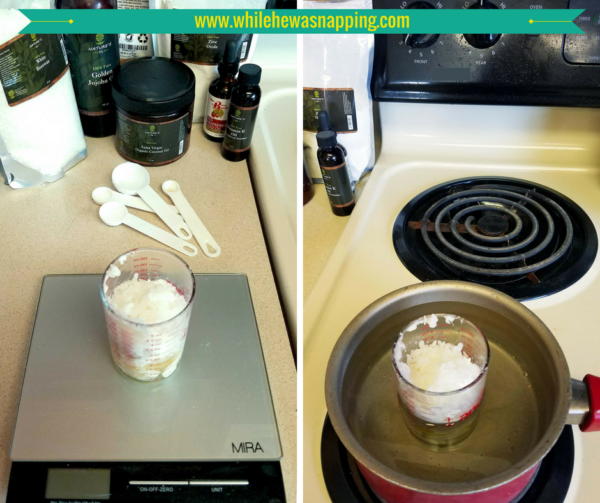 I did include measurements in tea and tablespoons too, but your results will be more reliable if you use the weight measurements. This sunscreen recipe has an approximate SPF 37. You can omit any of the ingredients and still create sunscreen, but it will change the SPF and possibly the physical make up of the lotion. I’ve included each ingredient’s purpose; so, if you do omit something, you’ll know what you’re losing. Okay, ready to protect your skin with all the good stuff? Beeswax – makes the lotion waterproof, anti-oxidant, anti-inflammatory and anti-bacterial. Step #1: If you’re using an actual double broiler, follow the directions it comes with. If you don’t have a double broiler, you can use a pot and glass jar. This is my method. Fill the pot with water until it is about 4 inches from the top. Place on the stove burner. Step #2: Measure out all your ingredients with the kitchen scale and put them in the glass jar. Put the glass jar in the water on the stove and turn the stove on to low-medium heat. You want the water to come to a rolling boil. Once achieved, turn down the stove if you need to. You just want to maintain that rolling boil. Too rapid a boil can tip your jar and your sunscreen will be ruined. Step #3: Let the ingredients melt and liquefy. Stir with your skewer, spatula or whisk to thoroughly combine. It should be white in color and creamy in texture with no lumps. The bubbles will pop as the lotion cools. Step #4: Remove from heat, turn off the stove, and remove the jar from the water. Be CAREFUL!! The jar will be VERY HOT! Let the lotion cool for several hours to room temperature, stirring occasionally to keep combined. 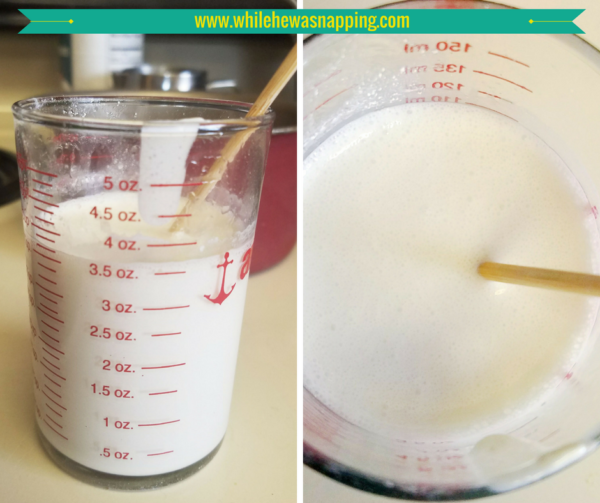 In the photo below, you’ll notice there is 3.5 oz of melted lotion in the measuring cup. 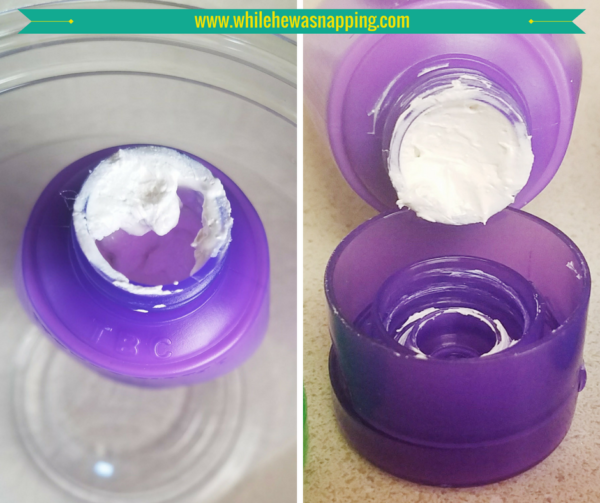 You’ll lose some of the volume to the jar and zip bag when you transfer the lotion. It will also condense as it solidifies. A 3 oz cosmetic tube is the size you want. Note: I actually tried pouring the hot lotion directly into the cosmetic tube and skipping the ziptop bag. It worked… alright. The tube didn’t melt like I worried it might, but it got pretty soft. This tube was a thicker plastic than the tubes I prefer, so a thinner tube may melt. The biggest issue though was mixing the lotion while it cooled. It’s really hard to mix anything well when there’s no room to stir it up. If you want a well mixed lotion, let it cool in the jar and use the ziptop bag. Step #5: Using the skewer, spatula or whisk, scrape as much of the cooled lotion into a ziptop bag. Snip a small corner off the bottom of the bag. Step #6: Carefully, fill the squeeze tubes with the lotion by squeezing it out of the bag and into the cosmetic tube. Squeeze the lotion to the bottom of the tube occasionally so you can fill the entire tube. That’s it. You just made your very own sunscreen! Use and store as you would any other sunscreen lotion. The shortest shelf life of these ingredients is 1-2 years. The vitamin E may help extend that. You’ll know it’s gone bad if it has an acidic or rancid oil smell. If so, toss it and start over. The leftovers from the batch I made last year are still going strong though. 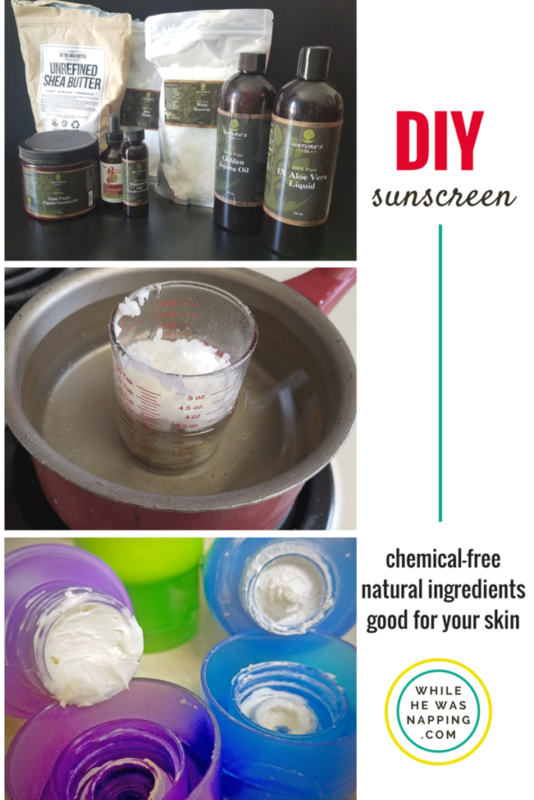 DIY SUNSCREEN THAT PROTECTS YOUR SKIN & YOUR FAMILY! If you’ve been wanting a different option than all those brightly colored bottles lined up on the store at the shelves, something with ingredients you can pronounce, something that will protect your family’s skin without harsh chemicals, then making your own sunscreen is a great choice. You get to choose exactly what is in the sun protectant you’re putting on your skin. 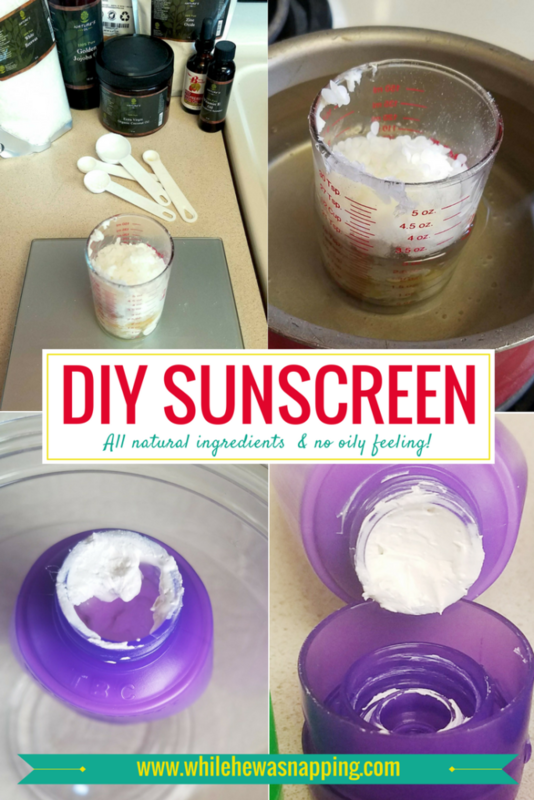 I have loved making my DIY sunscreen over the past year. If I can do it, you can too. So, get out there and have a safe summer! Protect your skin with DIY Sunscreen!